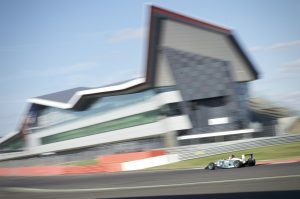 The 6th and 7th rounds of the Monoposto Championship took place over the weekend of 1st and 2nd July at Silverstone on the GP circuit. The weather was fantastic for the weekend, with the sun shining and lots of competitors could be found sunbathing next to their cars in between sessions. Qualifying on S aturday saw Chris Hodgen take overall pole for both races ahead of Ashley Dibden, who pulled in early with engine issues. Ashley said his car wasn’t on top form all weekend, but luckily he did manage to complete both races and retain the lead of the championship. Ben Cater qualified in third for the first race and second for the second race – which was determined by the second fastest qualifying time. Fourth overall and first in class was Jeremy Timms in his Hyabusa engine Dallara. Further down the field Phil Davis went off at Copse on the first lap of qualifying which unfortunately significantly damaged his car and put him out for the weekend. Hopefully Phil will be back up and running for Oulton Park at the end of July though. Damon Bland, in the 2000 class, also had issues during qualifying and had to retire after two laps and so was on the back of the grid for both races. Race 1 on Sunday saw a number of incidents cause two safety cars and a myriad of yellow flags. With such a large grid at Silverstone it is always nerve-racking waiting for the race to start and this is the only event of the year that uses a rolling start. The start was a clean one with all drivers making it safely and cleanly around the first corner, without anyone even breaking a track limit. But unfortunately this sigh of relief was swiftly followed by troubles with lots of cars. Jon Reed pulled off on lap 1 after his engine let go, as did Richard Gittings, Dan Levy was also out on lap 1 after contact with Kevin Otway and Mark Harrison pulled into the pitswith an oil leak. The problems didn’t stop there as David Gambling spun at copse on the start of lap 2, ending up in the gravel and setting off the first safety car. The safety car picked up Chris Hodgen who was still in the lead and led the pack round for 1 lap before restarting again. Jeremy Timms had gained a couple of places in the opening lap and was up to second place overall with Ben Cater in third, Ashley Dibden in fourth and Jason Timms rounding off the top 5. 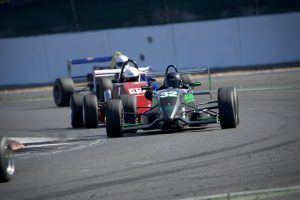 Jeremy Timms got up to first place on the restart and Jason Timms got ahead of Ben Cater for fourth place, demonstrating how competitive the 1400cc bike engine cars can be against the 2 litre Mono F3 cars. Unfortunately, Nick Catanzaro and Richard Snuggs had a coming together at Copse on the restart which put them both out of the race and caused another safety car. The safety car was out for two laps whilst the cars were recovered and the race began again with 3 minutes remaining on the clock. Richard Moorcroft had an impressive race in the Moto 1000 class, after qualifying fourth in class and 21st overall, he climbed up to first in class quickly and continued gaining track positions, eventually finishing 7th overall. He pulled a big gap over Dax Ward who was second in class and had 5 cars buffer from him. In the 2000 class Bryn Tootell got up to first in class, after qualifying third, and was being chased down by Paul Britten, who took the fastest lap in class and the lap record for the 2000 class. In the Classic class, Peter Whitmore won, with Ian Hughes coming in second. Matthew Walters took the victory in the 1800 class, with David Jones in second and Steven Griffin coming in third on his return to Monoposto after moving back to the UK from Dubai a couple of months ago. Geoff Fern won the 1600 class race, with Eddie Guest second and James Gordon-Colebrooke in third. Race 2 on Sund ay evening again had many challenges, with a red flag coming out on the first lap after a collision at Copse between Taylor Macvean and Richard Moorcroft. Both drivers were ok, but the delay in removing the cars meant that the race was abandoned and scheduled to restart at the end of the day. 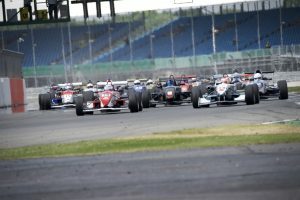 The drivers were pulled into the pits and regridded, whilst Formula Fords raced on track. Then the drivers were lead out for the race, which was allowed to run until 10 minutes after curfew thanks to the cooperation of MSVR and the circuit organisers. 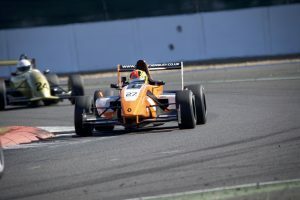 Jeremy Timms didn’t manage to get the jump on the Mono F3 drivers in the race and had to settle for third overall, but still won his class with Jason Timms close behind in second in class and fourth overall. An drew Gordon-Colebrooke gave a solid performance, finishing third in class again and 6th overall, he remains second in the Moto 1400 championship, behind Jeremy Timms and ahead of Jason. James Densley dominated the FR2000 class this weekend, with two wins and two fastest laps, this means that so far this season the FR2000 class has had a different driver set the lap record at each of the three tracks we’ve visited. Bryn Tootell got into the lead of the 2000 class race, after qualifying 5th in class, with a buffer of a couple of cars behind him and ahead of Mat Jordan, Terry Clark and Kevin Otway who were all close together and fighting for second, third and fourth in class. Dax Ward lead the Moto 1000 class by a big margin, with Mark Reade in second. Mick Kinghorn, Craig Hurran and David Heavey were all close together and fighting for third in class. Unfortunately for Mark Reade he got caught up in an incident between Mat Jordan and Terry Clark on lap 4 which saw Jordan and Clark off at Luffield and Mark Reade pull off into the pits. The race was red flagged after this incident as, together with Russ Giles who had gone off at Luffield earlier on in the race, there were three cars in the gravel there. As the leaders of the race had just crossed the line to begin the sixt h lap of the race when the red flags came out, the race results went back to lap 5, not lap 4, which meant Mark Reade could only come fifth in the race – a position he gained by crossing the start/finish line when pulling into the pits – instead of being second which is where he was on lap 4 before the incident occurred. This left Mick Kinghorn to come in second place in the race and take the lead of the Moto 1000 championship and by scoring the all important 8 points from finishing fifth, Mark Reade still managed to gain second place in the championship standings. 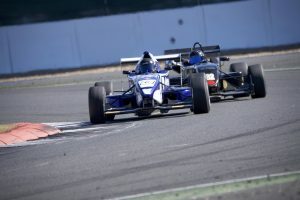 In the Mono F3 class, Ben Cater and Chris Hodgen had a close battle for the lead of the race, with Ben Cater taking the lead on the second lap and then pulling a gap to Hodgen. After a report from the marshals’ post at Brooklands saying that Cater had overtaken a backmarker under yellow flags, he was given a three second time penalty meaning that, although he was on the top step of the podium, he ended up second in the race behind Chris Hodgen after the results were amended. Ashley Dibden came third in class and fifth overall in the race. This means that Ashley still retains the lead of the championship, but Chris has gained some ground after two wins and a fastest lap. 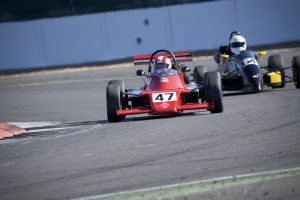 In the 1800 class, Matt Walters took his 7th consecutive race win and fastest lap, Douglas McLay came second after a close battle with David Jones, Marcus Sheard and Steven Griffin who finished third, fourth and fifth in class respectively. Geoff Fern won the 1600 class race again and broke his own lap record which had stood since 2012. Ian Hughes has risen to take the lead of the Classic 2000 championship from fifth in the standings after a successful weekend where he got a second place, a win and a fastest lap.